Ernst Spiess (born 1930) studied surveying and mapping from 1949 to 1954 and was scientific assistant to Eduard Imhof at the ETH Zurich from 1956 to 1958. Under Imhof’s direction he shaded the north-eastern part of the relief for the school (wall) map for the Canton of Schaffhausen. The rest of the relief was shaded by Heinz Leuzinger and Bruno Speiser. (Schaffhausen relief: Download). From 1958 to 1964 Spiess was a topography engineer at the Federal Office of Topography (swisstopo). In 1959 he took part in the Swiss Alpine Club (SAC) expedition to the Cordillera Vilcabamba in Peru, charged with mapping the Panta Group at a scale of 1:25,000. In 1964 Spiess became assistant professor and in 1970 full professor of the Institute of Cartography at the ETH Zurich, following Eduard Imhof. Here he worked up to his retirement in 1996. Under his direction as editor-in-chief of both the “Swiss World Atlas” (1978–96) and the “Atlas of Switzerland” (1979–2008) many shaded reliefs were created by him and other cartographers as a base for thematic maps. Relief shading “Neapel und Vesuv”, scale 1:250,000, © Schweizer Weltatlas, 1992. 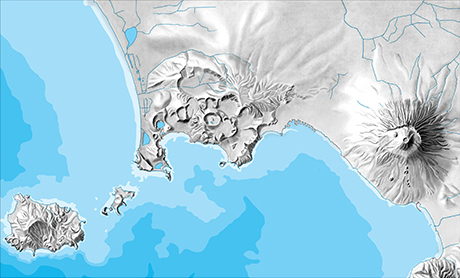 Panta map by Ernst Spiess, topography engineer at the Federal Office of Topography (swisstopo). Diploma work “Felsdarstellungen im Bösbächital” (pdf, German) by Ernst Spiess, p.27-32, 1954. Honorary Fellowship for Ernst Spiess, International Cartographic Association, 1995. Ernst Spiess is awarded the Carl Mannerfelt Gold Medal, International Cartographic Association, 2005.